Espanyol and Real Sociedad fought out a highly entertaining 2-2 draw at the Cornella el Prat on Sunday evening. Aguirre has performed well to date, lifting Espanyol from bottom to mid-table safety even at this stage of the season but their recent form has tailed off slightly. They entered this game with just one win in their previous four games. This contrasted sharply with a Sociedad side that now harbours prospects of Champions League football next season at the Anoeta. With Carlos Vela missing, Montannier opted to bring Zurutuza into the side in midfield. Whilst Espanyol chose a 4-2-3-1, La Real were more like a 4-1-4-1 although the wide pairing of Griezmann and Prieto pushed higher than the midfield duo or Zurutuza and Illarramendi. Real started the game better, more aggressive than their opponents but they were caught out after just eight minutes when Sergio Garcia opened the scoring. The attack began on the right but quickly shifted to the left with Xabi Prieto flighting a ball for Simao to collect. It meant Sociedad were turning and backpeddling towards their own goal rather than have the opponent face them. Simao’s low cross was deftly slotted home by Garcia who had run beyond both De La Bella and Inigo Martinez to get to the ball first. The early goal allowed Espanyol to counter and forced Sociedad to take the initiative. 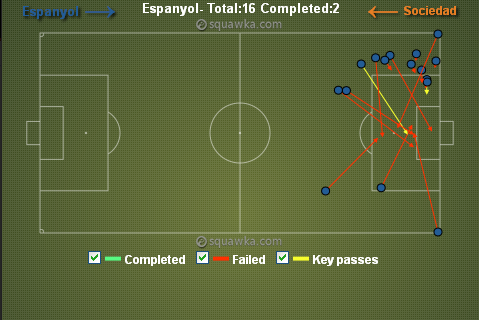 Of the 16 crosses attempted, only two found an Espanyol player and both resulted in goals during the first half. A number of crosses were blocked but with less cover in the Sociedad midfield, it was easier for Espanyol to create the openings by spreading the play with crossfield passes. 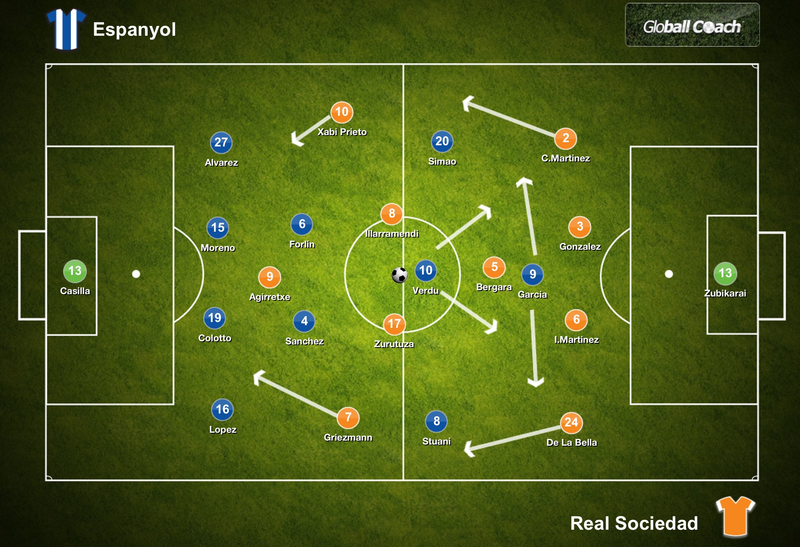 It meant Sociedad were more exposed and in less control than they like to be. And Espanyol were able to profit with the assistance of their striker, Sergio Garcia. He may not be everybody’s favourite striker and he may not be the most prolific goalscorer either but last night Sergio Garcia produced the sort of display that has always been capable of delivering even if he was often frustratingly inconsistent. Statistically, his performance was not that impressive. Just one shot at goal albeit with which he scored. Only one successful take on against eight attempted. Garcia lost out on his two aerial duels as well. But he completed 26 out of his 37 attempted passes. He is not disconnected form the team. Always available to take a pass and link play. The key to his performance was his movement, intelligence and ability to link up with the remainder of his team particularly Verdu who roamed behind him. Their combination led to Espanyol’s second goal, Garcia playing a tidy one-two with his captain before Stuani converted the cross. In their recent away game at Atleti, La Real were very conservative from the outset of the game, playing a highly cautious counter attacking style. Although that is their preference, they were more aggressive here perhaps sensing this as an ideal opportunity to claim all three points. 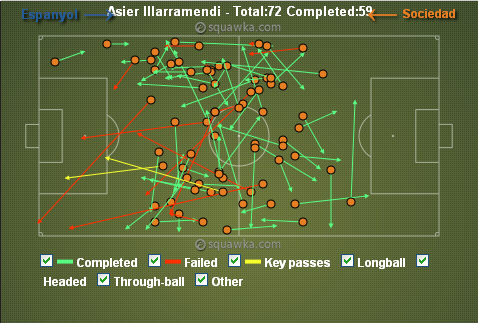 The most noticeable difference from recent away games was Illarramendi being pushed higher not and not being used as part of a double pivot alongside Bergara. The higher position uses Illarramendi’s qualities in a better fashion. His more direct passing can aid the team and led to the equalising goal. Prieto made a diagonal run from left to centre and Illarramendi lofted a pass through to him. Casilla cleared the ball which fell to Zurutuza around 25 yards out and his first time lobbed finish found the net. The finish was one of the highest technique but in the process the pass and run which led to the goal were overlooked. Although a different player from Xabi Alonso, the fact that both began their careers with La Real will lead to comparisons especially when there is something of the Alonso about the passing of Illarramendi on occasion. The misplaced passes above all tended to be longer, flighted passes searching out runners in behind the Espanyol defence. One led to the first goal and in the 55th minute a similar ball found Aggirexte but Casilla saved the resulting shot. As it was, Illarramendi was withdrawn for the gifted Pardo in 62minutes. And the youngster lofted another ball over the Espanyol defence for the timed run of Griezmann. Despite miscontrolling the ball, it ricocheted off Lopez into the bottom corner to provide Sociedad with the equaliser. The goal came following a period of Sociedad pressure. The attacking talent of Verdu, Garcia and Stuani were curtailed as the game had wore on and Sociedad were able to exert more authority on proceedings as a consequence. Javier Aguirre has guided Espanyol from the bottom of the table to mid-table security, a tremendous achievement given how he found the club when he took over. As ever though, how he builds from here for next season is key. Verdu is out of contract in the summer and is not the type of player that Espanyol can afford to lose especially as they will receive no fee. It’s now just one defeat in 19 games for La Real, a very impressive run of form that sees them maintain interest in the Champions League place. They remain on course to record their best league finish since their great side of 2002/03 which narrowly missed out on the title. The number of recent draws though, could cost them. That is four draws in their last seven league games. Even if they do not secure Champions League football, under Montanier they have developed a clear style of play which is highly enjoyable to watch with a number of excellent young prospects. This time last season, if you had to choose a Basque side that would be challenging for Champions League football just now, how many people would have chosen La Real over Bielsa’s Athletic?